E.G. Peirce, the collection is now housed in the renamed Archive Room which is on the upper floor of the Modern Languages Building. The Archivist answers enquiries from staff, pupils, Old Blundellians, and, more commonly, from members of the public, as well as putting on displays and exhibitions for special events, such as Old Blundellian Day. The Archive contains more than 20,000 items, consisting of a wide variety of documents, such as letters, newspaper cuttings, photographs, and a few objects. There are several very important documents, which are not only of interest to the School, but also to the town of Tiverton and the county of Devon, as well as to the study of education in general. The earliest item, dating from 1456, is a lease of land in Tiverton that subsequently descended to Peter Blundell (and then to the Governors), and is just one from a large collection of property deeds, including those of the School’s former lands in South Devon. The administration of the School generated many valuable records, including the Great Account Book which lists in detail income and expenditure from 1610, and the Books of Orders, containing the minutes of the Governors’ meetings, beginning in 1665. Additional material is always wanted for the Archive. 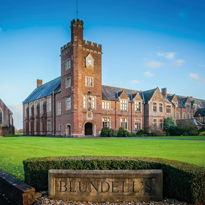 A lot of modern items come from the School itself, and other material is sometimes given by Old Blundellians, former staff, or even bought from eBay. These items can be of any Blundell’s-related interest, such as photographs, essays, drama or music programmes, information on Old Blundellians, correspondence, etc. If you wish to donate Blundell’s material it is always advisable to contact the Archivist before sending in your items as we may already have copies. If you are considering leaving any of your effects to the School in your Will, please see the Archive Donation Form. Recently, we have been contacted by executors of Old Blundellians informing us of the bequest to the School of large collections of material, such as books and music CDs and LPs. Generous as these bequests were, we have had to decline taking much of the material, whether for reasons of lack of space for storage, or because it was irrelevant to modern teaching purposes, or it was not of archival interest. This, of course, is a sad state of affairs as it means that the testator’s wishes have not been fulfilled. To avoid such a situation, we would like to ask you to inform us if you are considering leaving the School a large collection of material, so that we can decide whether we are able to receive the gift.